is there any way to automatically associate the album art from itunes to the actual file... Ie. can I embed in the file the album art stored in the itunes ITC2 file without selecting all albums, copying the file, the pasting it in? Is there any script or anything you are aware of that will embed the jpg to the mp3 without the manual copy, paste? I have not used any software that does this automatically. Could be that MusicBridge (http://jrmwillis.googlepages.com/) can do this, but I don't know. 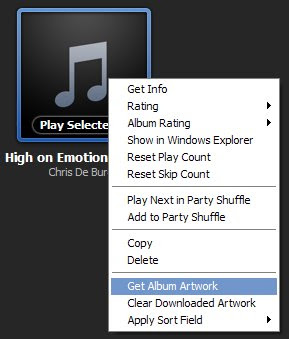 songbird stores the album art in the file automatically. if the cover is not found for any reason there is this nice drag and drop feature to add them to the file. 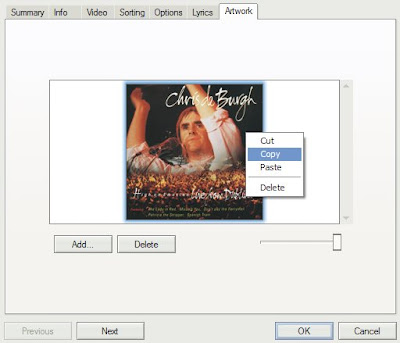 Is it possible to show pictures for individual mp3 files (not just folders) on windows explorer? Obviously windows explorer can show thumnail pictures for video and image files, and for folders containing mp3 files, but is there any way of adding a picture for an individual music file or any other type of file within windows explorer? Within the "Artwork" tab, I copy and then paste back the image. Sometimes the result is that the image become imbeded in the mp3 file but it does not work every time. I don't understand why. Sometimes, even if the file grows in size, the image does not show. When the copy/paste procedure does not work, I simply copy the image in a folder then use a id3 tag editor to imbeding the image in the mp3 file. I am using a Android HTC Desire HD, HTC sync software to take certain playlists off Itunes and onto my mobile. However it only takes a (seemingly) random selection of the album art. 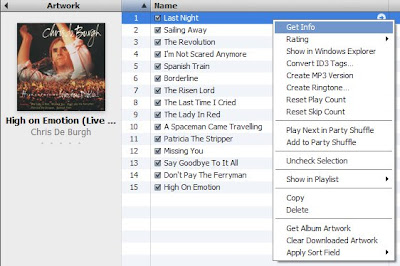 However by following your advice and forcing Itunes to embed the picture it is fixed!.